Your sewer system is responsible for removing waste and waste water from your home. While you can turn off your water, there’s no way to turn off your sewer when you’re having a problem. Sewer problems arise more frequently than anyone would like, and when they do, the results are often disgusting and disastrous. At GT Campbell Plumbing, we offer professional sewer repair in Victor NY and the surrounding areas. Whether you need help with routine maintenance to prevent system failure or you need a 24-hour emergency plumber to help you deal with a sewer catastrophe, we’re here for all of your Victor sewer repair needs. …and more. 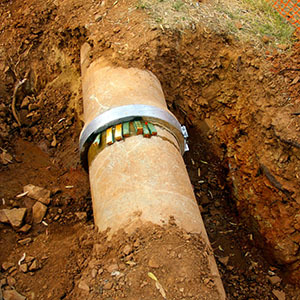 If you’re in need of any type of sewer repair or maintenance, we’re here to help! By taking care of your sewer system, you can avoid a lot of disgusting problems. One of the best ways to maintain your sewer is by having it inspected, cleaned and serviced annually. Keeping up with basic maintenance helps to prevent major blockages and gives your plumber an opportunity to correct minor problems before they turn into major disasters. At GT Campbell Plumbing, we’re proud to offer dependable sewer repair in Victor NY. No matter how large or small your problem may be, an expert plumber in Victor NY can help. When you contact us, we’ll dispatch a Victor plumber right away. After assessing your problem, we’ll provide you with an honest estimate and get to work on providing a solution. We stand behind our services, and we guarantee that you’ll be happy with the work we provide. Whether you’re having a problem with your sewer or you’re looking for ways to avoid disaster, contact us today.